I decided I needed a ride to celebrate my upcoming Birthday. So I took the day off work and headed up the Putty. I left pretty early, so by 7:30 I was just above Windsor. I stopped at Colo Heights for breakfast before pushing on. After the rest, I headed up to Broke for fuel. I was half thinking of coming back and doing some laps of 10-mile, or I even considered heading across to Wollombi and maybe Wiseman’s or Old Pac. I headed back down the Putty, and ended up doing 1 more lap of 10-mile before deciding to start heading home. Stopped for a flash burger at Grey Gums (and flash burger prices too! ), it was nice, but I see where they have put together the money to seal their driveway! I was really happy with my riding, especially in the more technical sections. I feel as if I went faster (no one caught me, but the lack of traffic may have been a factor there) and I felt a LOT more confident as I did. I’m still not going to win any races, but I felt that I didn’t freak out at all (except a couple of moments where I lost concentration and completely forgot where the road was headed, tired). It was a good ride. From up the Putty yesterday. Mrs Mab let me out for a ride this NYE Eve. 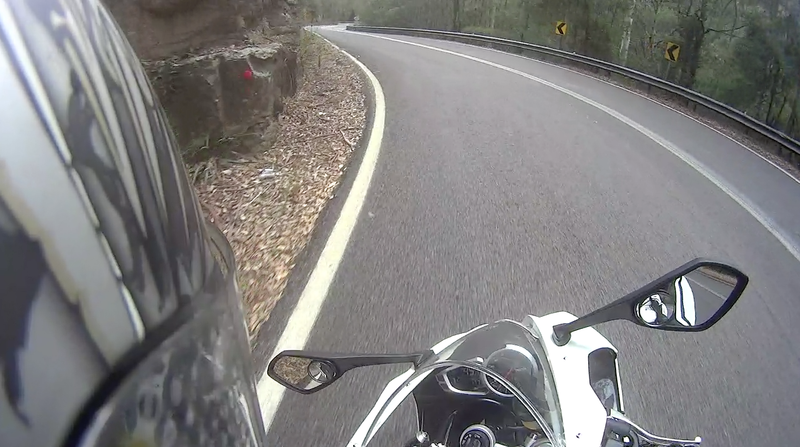 I headed up the Putty, leaving home at about 6am. This way I could be home with some time with the family. The second time past it was busier than I expected. My first time up here since the previous spring (in 2014 that is). There didn’t seem to be much different along the road itself. I expected only a few bikes if any – even though it was shaping up to be a clear 25C day. It is double demerits from before Christmas until after New Years, so a lot of the young or silly crew stay away. I passed a police car just outside Wilberforce, he had a customer (and it was a car) already so ignored me. I got to Grey Gums shortly after 0730. By this time, I was pretty hungry, I kept getting distracted by imagining a big bacon, eggs, sausages sorta breakfast. 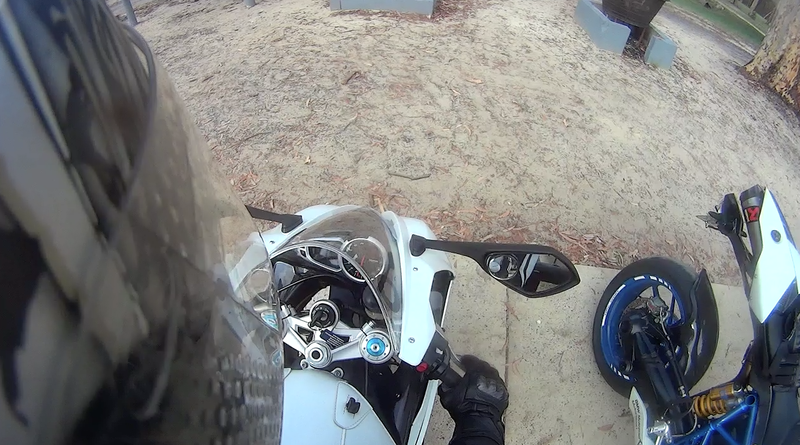 Didn’t quite cause me to crash, but I certainly had to refocus a couple of times. I had never arrived this early and I was worried it would be shut. As I rolled down the road (the entrance a little past the cafe when you are northbound) it was clearly open. Apparently from 0700. Everyday except Christmas Day. New owners I think, certainly some renovations. More shade, more tables and more concrete exclusively for bikes, gotta love em. A hearty breakfast (which also included toast, mushrooms and onions) and I was on my way. I hit Ten Mile and did 5 laps to end up heading towards Broke (for fuel). It is a great stretch, but it takes almost 2 hours to get there from home. There has been some roadworks done. Some corners widened but the most significant was on several of the corners the armco now stretches right to the ground and the posts are behind. Importantly that should mean its harder for a crashing rider to slid under or hit a post when they hit the armco. A lot better than more wires. Very happy with how I improved across the runs as I loosened up. Still slow compared to most, but smooth and safe. Interesting, even though I generally stick close to the speed limits, even I felt an overwhelming urge to check my throttle early out of many of the corners. That did put a little damper on it. After Broke I contemplated going home via Wiseman’s Ferry, but decided I would already be away a long time and I don’t know if they have repaired the river side leg, it was pretty rough on the VFR. 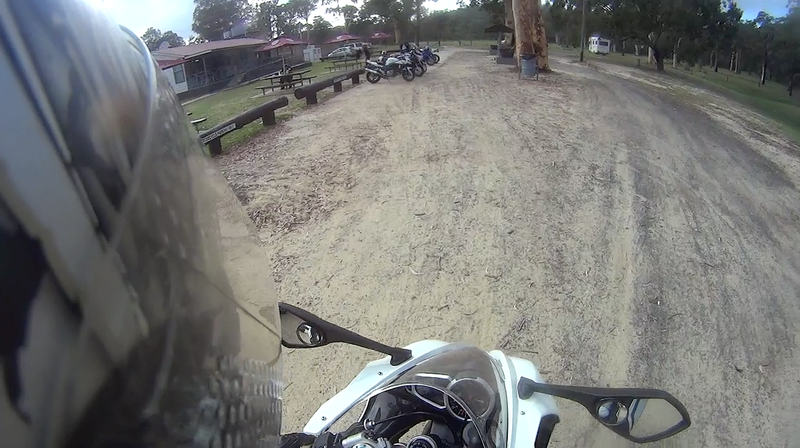 On the taunt Daytona I would be scrambled. My last trip down the Ten Mile was spoiled by some old tourists from Queensland who drove slow and couldn’t stay in their lane. Eventually they were passed. 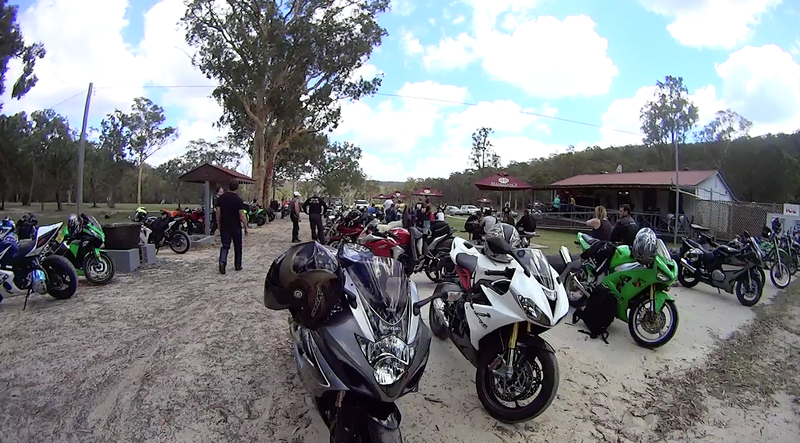 I stopped again at Grey Gums for a snack then straight home. An enjoyable ride, but its been a while since I’ve done such a long one (about 6 hours in the saddle) and I felt a bit weary the last hour. 1st September – first day of spring dawned bright and sunny. Mrs BBB was at work and the kids in school. So the Daytona went out for a ride. I intended to head all the way up the Putty Rd and do some laps of the 10 mi Putty at the top, but I got to the fun stretch at Colo and changed my mind. I spent the next hour or so running up and down the hill having a blast. The weather was great, the traffic was light and no police were spotted. Of course, the next day it was raining and miserable, so Spring teased us a little. Then it’s off to Hawaii for a week, just the Mrs and I. After that, I’ve gambled that the Monday I head back to Canberra will be nice as I have my Daytona, my leathers and no wet weather gear. I’m half hoping to head over through Abercrombie. If that isn’t looking good, I might look at heading down through Kangaroo Valley and up through Nowra I think. 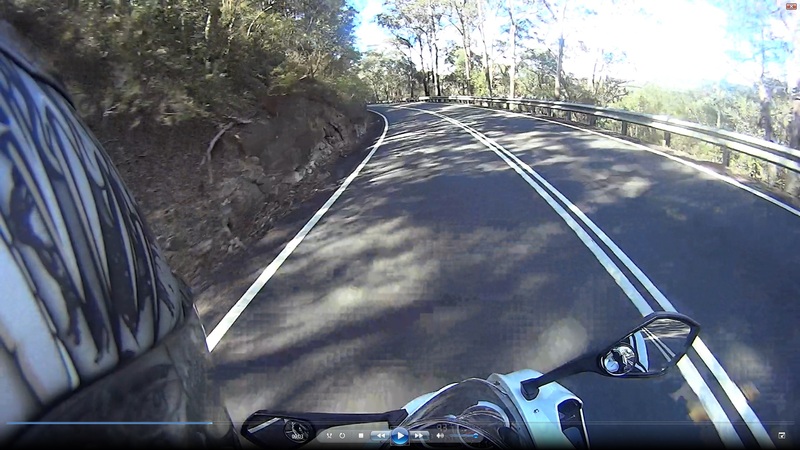 Up early, beat the crowds, beat the heat, beat the cops, and be home for lunch after 5 hours of one of the best roads in Sydney. Sounds like a plan. I was invited to join a couple of mates very early Sunday for a Breakfast at Grey Gums… and maybe a bit further after breakfast. So 6am finds us meeting up a a nearby petrol station about to head up the Putty. It would seem that my last dash up this road wasn’t to be the last. This one might be but who cares. So we made Grey Gums in easy time. The carpark was a bit empty. But the lack of vehicles didn’t give us a hint of how many flies there would be. Made breakfast interesting. Ah summer, in Australia = flies. So we’d made it here. Some quick maths and we turned north, we should easily be able to head up to the top of the Putty and still make it home for lunch. This lead me up to the 10 mile Putty again. I really wish this patch was much closer to home, or I could get a day up here doing a few laps. It’s picturesque – but then I’m not really looking at that. After fuel, another roll down the 10-mile and it was back to Grey Gums. What a difference a couple of hours can make. On a nice day, on a Sunday, the first Sunday after double demerits has finished and the holidays. Almost a perfect storm. With so many people the flies were spread much more thinly so our snack was more comfortable. It was getting warm and time was starting to run out, so we headed homewards. And I was home in time to head out with the family for Yum Cha. 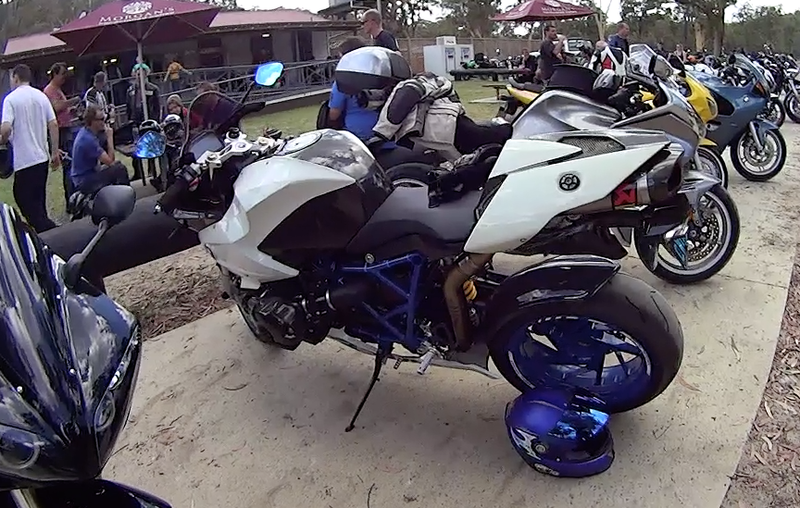 One of the bikes I rode with, a BMW HP2. 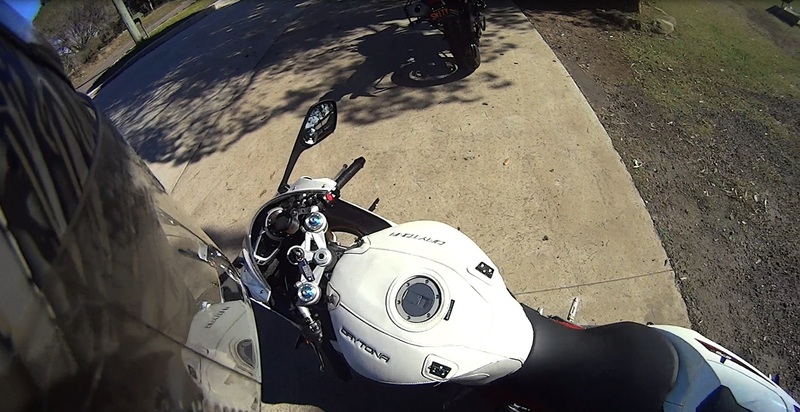 Very nice and there was a fun moment as we both leapt away from the lights at high rev, quick shifters (no need for clutch with these) blipping….. then we were good boys again.